Sanjay Leela Bhansali’s Guzaarish is on Netflix, and I just watched it. I felt better having watched it at home because in a theatre I would have walked out feeling cheated. The movie does have its plus points and I will come to them, but one big plus was that it was mercifully less than 2 hours long. Bhansali excels at showing opulence in his sets, and there is plenty of that in Guzaarish — limitlessly high ceilings and tall curtains. If you are looking for fantasy, if you are looking for great cinematography, if you are looking for opulent sets, this movie is for you. There are also some great performances, particularly the one by Hritik Roshan, who plays a quadriplegic named Ethan Mascarenhas. The theme (of euthanasia) is serious and thought-provoking, but has not been treated right. If you are looking for some realism in a movie like I usually do, then stay away from this one. Instead of doing a full review of the movie, I will just quote from some reviews it has already got in the media, particularly the ones I agreed with, then I will list the things that irritated me personally. Everything else, like Aishwarya Rai’s make-up, seems fake and loud, and puts you off. The emotions, the set design, the dialogues, Hritik Roshan’s beard are all out of this world, residing in some alien planet that only Bhansali inhabits. I’m from Goa (where the film is set) and I can assure you, I don’t know of too many Goan women who wear Victorian skirts, have elaborate hairdos and bright lipstick, all the while nursing a paraplegic man. Actually, I don’t know if women anywhere do that. Sanjay Leela Bhansali has positioned himself as Hindi cinema’s poet of pain. His movies are operatic and highly melodramatic. But over the course of six films, the worlds Bhansali creates have become increasingly sealed off and removed from any known reality. So even though the characters in Guzaarish ostensibly live in Goa, the milieu isn’t one that you would recognise. This fantasy would be effective if the writing was more organic and the emotions felt more authentic but Bhansali never gives us a chance to invest in these people. We are talking about a glossy, surreal, picture-perfect set put together by four production designers, not one of them capable or smart enough to figure out that such a character who has been living out of a wheelchair for 14 years would probably need a disability ramp in the house, especially if the character prefers to stay under a leaky roof on the first floor. Before you try to milk the audience for sympathy and manipulate a serious issue like disability for tears and melodrama, how about understanding the special needs of such a character to live with dignity? justify the protagonist’s guzaarish (request) for euthanasia. Ethan is living a good life for a paraplegic. He can afford full time servants, a large house, owns a radio show, has a lovely lady taking care of him, can still teach and create magic, has a fully functional brain. This is much more than can be said of real life paraplegics. His desire for euthanasia suddenly comes from nowhere one fine day after 14 years, with no apparent and immediate reason. When he presents the argument on his radio show, even a group of paraplegics (the “quad squad”) vote “no” on his proposal. Then what arguments does he present that sway the public opinion in his favor? NONE! His ex-lover is the only one who speaks in his favor “because she loves him and understands how he feels.” This may make sense for one or two or six people who personally love him, but is not enough to create so much public support that there are people standing with placards outside his house when there is a court hearing there. No placards are shown against his position. 2. Regarding the magic (the protagonist’s profession), it is not clear if he is actually supposed to be performing magic or just trickery. Half of the movie has the viewer believing that he is actually performing magic (he can make it rain, teach magical spells), but then there is the scene of the sabotage/accident when it is shown that it is obviously the trickery. Then in the last scene he is able to pull a trick on his pupil (the Draupadi sari miracle) when neither his arms nor his legs are working. Was that magic or was that trickery? If he was that functional then why die? who have just their limbs non-functional can do much better than die. Quadriplegics participate in paralympic games. Nobody makes that argument in the movie. I have personally seen paraplegics swim, and have seen them do much more on film. If you are only as disabled as Hritik Roshan is shown in the movie, such a wish to die would be termed as plain suicide. Thankfully the judge doesn’t allow it in the movie, but the arguments in favor or against the case could have been made more convincingly. After all, that was the point of the movie. Wasn’t it? 4. In the last scene, Sophia (Aishwarya) decides to kill Ethan (or “help him die”) but before that she “marries” him. It looks like this criminal agreement to kill Ethan is also made known to all friends because there is a farewell party for him — with the understanding that after the murder she is going to jail. Does not make a lot of sense. Does it? 5. Towards the end, so many elements are introduced in such a haphazard way that they make no sense except direct the story to its intended end. The way Aishwarya’s husband appears out of apparently nowhere, his sudden mistreatment of her, her divorce, then marriage, the leaking roof in an otherwise magnificent house over which the magician who can make rain has no control — all these elements make for good fantasy, but not much realism that is needed for such a serious topic. The healthy sixty-something-looking mother (Nafeesa Ali) has to not only not hear her son’s shouts for help, but suddenly die peacefully for no apparent reason, as if she was in her nineties. 6. The setting shown in the movie is Goa, but not much in the movie looks or sounds Indian. Even Omar’s name is pronounced in a foreign way — Omaar. If the director were entirely honest, he would have had a line saying it was, at the very least, “inspired by”, but then who in Bollywood is, unless they are held at gun point by the studios the films are being stolen from? Well, I can go on and on about this movie, but let me also acknowledge that lots of people have immensely liked the movie and they must have their own reasons. There are also some rave reviews online. I guess some people like fantasy, some like sci-fi, some like cartoons. I go for realism. Give me “Peepli Live” any day, even if I am the only person in the theater — which was the case when I watched the movie in a DC area theater last summer. Classy stuff? Not for me. I liked the “100 gram zindagi” song in the film though, but that also summed up the weight of the movie for me. Good to see people dissect a movie so much. 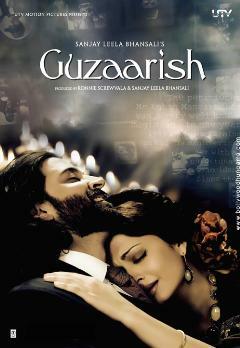 I never saw Guzaarish but then Bhansaali is not into realistic cinema. I agree with Sunil Deepak the amount of argument you have put forth leaves the other side no chance. In any case, if you decide to win an argument, Raman, God only save the opponent. I remember this, with some melancholy, since my childhood. @ sanjay… i can see your love for RK in your comment… still, the same, the graet and… God bless you. After reading your piece, I hope you would love reading my two articles on the movie too.